Love Bombs falling on Chinatown, Honolulu January 2008! What started out as a silly play on antiwar sentiment, Love Bombs are finding a niche in history. 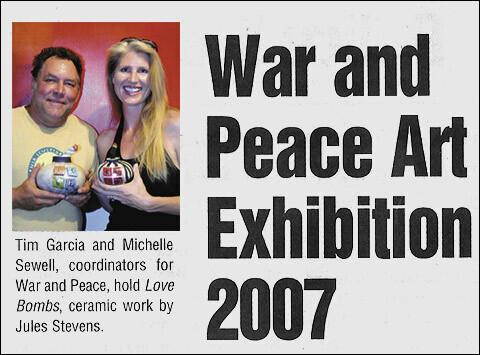 Ceramic work by Jules Stevens originally conceived for the show titled, War and Peace which ran during the month of July on Maui, Love Bombs along with other Maui artist's work, opened in Venice, CA in November and will travel to 4 other mainland locations including Austin, TX and Portland, OR. What is a Love Bomb? Love Bombs are a contemporary ceramic series by Jules Stevens from Maui. Says Stevens, When asked to create artwork with a theme about war or peace, I choose peace. The concept is catching on quickly as they take on a life of their own. People just look at them and smile. They are almost cartoon like says Stevens who creates them out of clay. First I create a round orb, then I finish the top with a ridged tool giving it a machined look, a fake wick is painted to appear to be burning and the letters L O V E appear to be stamped on. They are raku fired with a glaze called white crackle which creates the illusion of exploding. Love bombs are bursting with positive thoughts and good karma. Ignite the wick, stand back and feel the love flowing inside you. Know someone who needs love, love bomb them. Need a little love yourself, get bombed! Create an explosion of LOVE. Everywhere you go, as often as you can. Put love back into the universe. Just think, wouldn't it be great if we were dropping love bombs all over Iraq right now? Love Bombs will be the featured window display at Mark's Art Garage during the month of January. Opening night coincides with the first Friday celebration in Chinatown, Honolulu. Be sure to see this fun and important display! 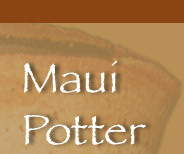 This website offers educational information about how to become a better potter. Also, offers travel writing on different places to view pottery and ceramics around the world. Jules Stevens has lived and worked on Maui for the past 7 years. She works out of her studio in Haiku called the Puakenikeni Pottery and fires her work at the Hui Noeau in Makawow. She enjoys producing large scale sculptures. Black and White Bamboo is a life-sized contemporary ceramic sculpture which emulates real bamboo and moves in the wind, is installed on the grounds of the Hui Noeau.